After years spent traveling the globe with yeast and flour in hand, consulting for many of the best bakeries in the world, Lionel Vatinet, along with his wife and partner Missy, realized his lifelong dream and opened La Farm Bakery in Cary, North Carolina in 1999. La Farm Bakery is a modern bakery where families come together around the table to share their lives as they share a good meal. The founding philosophy of La Farm is born out of the experience and tutelage of Vatinet’s training in France’s prestigious artisans’ guild, Les Compagnons du Devoir. Our goal is to continue the centuries-old baking traditions and techniques, honoring the ordinary, yet extraordinary, boulangeries that once flourished in every little town in France. Combine pastry flour, baking soda, salt, nutmeg, allspice and cinnamon in a large bowl. Stir together until well mixed and then sift into a mixing bowl. Combine canola oil, water, eggs and pumpkin puree in a separate bowl and mix thoroughly. Add wet ingredients to the dry ingredients in the mixing bowl and mix at low speed for 3 minutes stopping occasionally to scrap bottom and sides of bowl. Add sugar and mix until well blended on low speed. 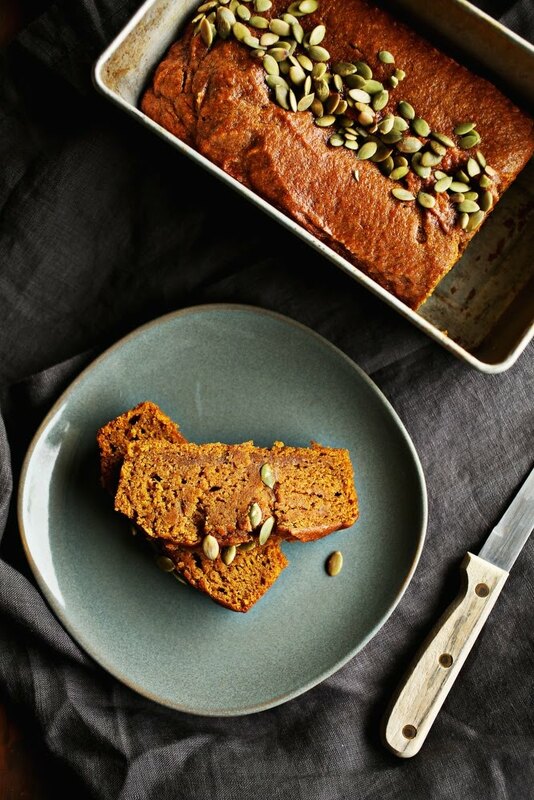 Pour batter into a lightly greased or oil-sprayed 9-inch-by-5-inch loaf pan. Sprinkle pumpkin seeds on the top. Bake for 40 to 50 minutes or until toothpick or cake tester inserted in loaf comes clean. Remove from oven and cool for 10 minutes and remove from pan. Cool completely. Wrap in plastic wrap for room temperature or refrigerated storage or add a layer of foil for freezing.